There were so many questions about cooking fruit butters in slow cookers left on the blueberry butter post that I thought I’d talk a little more about how it works, how to do it and why it’s a great technique. I do apologize that it’s taken me so long to get this posted, but such is life. How would you go about getting lavender flavor into a batch of blueberry butter? In my experience, there are two ways to infuse flavor into a preserve without leaving behind bits of the original flavor element. The first is to steep the flavor element in hot water or simple syrup until it is sufficiently potent. The second way to go is to tie up a few spoonfuls of your flavor element in a bit of cheesecloth and let that packet steep while the preserves cook. The first technique is just fine if you don’t mind adding a bit of additional liquid to your recipe. However, in the case of butter, you’re already going to spend hours cooking the existing liquid out of your fruit, so it doesn’t make sense to add more. So with this recipe, I would have used the cheesecloth packet technique, tasting regularly to determine when I thought the flavor was infused enough. This may be very elementary, but why/how is it considered a butter? Also, what is the difference between a jam, jelly, butter, etc. A fruit butter is named as such because it mimics the smooth spreadability of softened butter. It is cooked low and slow for a number of hours, in order to evaporate the excess liquid, concentrate the fruit flavors and intensify the innate sweetness in the fruit. Thanks to this concentration, it typically contains a minimal amount of additional sweetener. 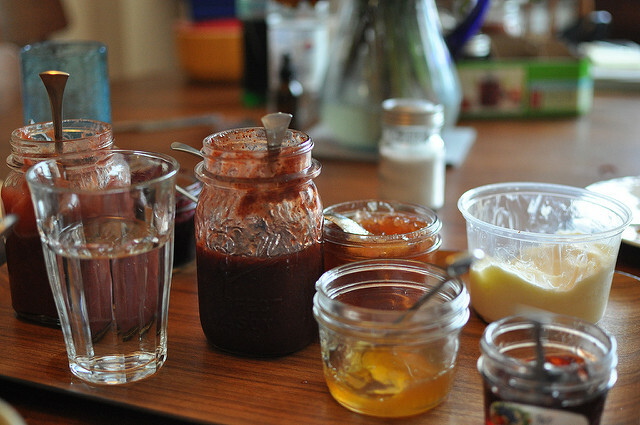 Jams are made with whole fruit that is cooked with sugar until 220 degrees (or thereabouts). The sugar to fruit ratios are high. Some jams contain additional pectin to ensure a good set. Jellies are made with fruit juice, sugar and pectin. They are well-gelled and don’t have any bits of fruit. Can you process the blueberries in a food processor instead of a Vitamix. You totally can. Just make sure to pulse it, you don’t want to turn it into juice. Can you do this in a newer slow cooker? You certainly can do this in a newer slow cooker. Just make sure to mind it a little bit more closely so that it doesn’t scorch. Regardless of what cooker you use, just make sure to fill it at least three quarters of the way full. The heating coils in a slow cooker go all the way up to the top, so if you leave too much of the cooker empty, the top of the butter can burn while the subterranean fruit pulp doesn’t cook sufficiently. What else can you make in the crock pot? You can do all number of fruit butters in the crock pot. I’ve followed the same formula for sweet cherry butter, apricot butter, fruit butter and peach butter. Delicious stuff, all of it. If you have any other questions about making fruit butters in a slow cooker, feel free to leave them in the comments section. I will do my best to reply! Hi Marisa, your posts are so informative and patiently explained! 🙂 I would love to try your fruit butter recipes (and others), but I am hesitant to purchase a bunch of canning equipment before I’ve tried it out. I’ve only got a 6 quart stock pot – would this be big enough for 2 or 3 half pint jars? Is it possible to stuff a dishtowel, steamer basket, or other common household item in the bottom instead of purchasing a rack? I’d like to use half pint jars or even smaller would be fine. Maybe you could do a post in your “Canning 101” series to address how to try out canning without purchasing anything but the jars. I would feel much more comfortable with the encouragement of an expert like you! You could also try contacting your local Mormon church; most of them regularly hold canning/preserving and food storage classes and some allow non-members to participate. I made a bunch of butters last year in my crockpot (blueberry, cherry, strawberry — to name a few). A few times I used my stick blender to chop things up while still in the crockpot. I also propped open the lid of my crockpot with two wooden spoons. It splattered a made a mess, so you might want to cover close surfaces with an old towel. The timing of flavor additions matters a lot. To ensure the right flavor balance, you don’t want to add your spices or sugar until the fruit is cooked down. The timing also matters if you do a mixed batch of fruit. Last year I made two different batches of strawberry apple butter (using frozen strawberries). In one I added the strawberries with the apples, and in the other I added the strawberries towards the end of cooking time. I was surprised at how different their flavors were. The latter was more tart, and quite bright, while the former had a deep strawberry flavor and tasted like a strawberry fruit roll-up. In regards to how much fruit is required for butters, I’ve found that cheaper fruits like apples and rhubarb (for me) pair well with other fruits and let the other fruit flavor shine. In my strawberry apple butter, my ratio of apples to strawberries was high, yet it tastes mostly like strawberries. While you don’t have pure strawberry butter, you have a greater quantity for less money of a butter that’s very flavorful. My question for you Marisa is about blending/chopping the fruit before you cook it down. Other than apples, I usually put in the fruit in big chops, and I always use an immersion blender at the end to make it smooth. You don’t use an immersion blender at the end–is the texture of your butters kind of chunky? After seeing your blueberry butter, I got inspired to make a strawberry rhubarb butter. It’s gotten raves from everyone who’s tried it. Thanks for the inspiration. Monica, I’ve done 2 or 3 half pint jars in my 6 quart stockpot without a problem, and I’ve never used a rack. I just grab them out of the water with tongs. The jars don’t move around in the pot too much. I’d encourage you to buy the jars and try it. If it doesn’t work out, you can always use the jars to store odds and ends. Good luck! I would love to hear how you did your strawberry rhubarb butter! My rhubarb is starting to make an appearance and I’m itching to get fruit butters going. I’d like to say that I just recently began reading your blog on a daily basis and I love it. I’m an avid canner and food blogger myself and I love to see what kinds of neat things others are doing. I thought I’d answer Monica’s comment above. I hope nobody feels that I’m butting-in. Monica, I actually don’t have a water bath canner. I have a pressure canner that I use as a water bath pot for large amounts of jars and I purchased an inexpensive aluminum stock pot to use for smaller jobs. The key is that your pot needs to be tall enough to cover the jars with water by at least an inch and still have room to boil. Most stock pots that come with cookware sets can’t do that for quart jars but 8oz and 4oz jars work just fine in very small batches. As for the rack, I’ve actually gotten away with placing the jars directly on the floor of the pan. While everyone will tell you that’s a no-no, I’ve never had a jar crack that way…yet. Your towel idea sounds like a good one. I may try that. I’ve also heard of twist-tying some mason jar rings together side-by-side to make a platform but have never had success with it because the geometry never seems to work out right. The only specialized tool you kind of need is a jar lifter (special tongs made to pick-up hot jars). I’ve never found a good replacement for it and you do need to get the jars out of boiling water somehow. If you just want to try things out, I’d recommend purchasing the Ball starter tool kit that has a jar lifter, food funnel, and lid magnet. The funnel is not necessary but makes the job so much easier. The kit is inexpensive (like $15) and your fingers will thank you in the long-run. Plus, it’s easier to store than a huge canning kettle. Oh, and you don’t have to special order it. Around this time of year, they’re on-hand at small hardware stores like Ace and in Walmart in the kitchen section. Monica, it looks like Justin has got you covered, answer-wise. However, if you need a little more detail, I did do a post on The Kitchn back in February that walks you through how to can with only the equipment in your kitchen. Anduin, I’m in complete agreement with you about the importance of timing when it comes to spices and using a combination of precious and more accessible fruit. I like to process into small pieces before beginning cooking because I think it speeds the cooking process. Also, I do often use an immersion blender when making fruit butters, it just depends on the texture of the nearly-finished product. Orora In terms of the rack issue, I’ve found that the more powerful your stove, the more important it is to have something protecting your jars from the direct heat of the burner. I’ve only made butters a couple times, but I might need to give them more attention this year! Last year, I made pumpkin butter in my slow cooker with the usual pumpkin pie spices. It came out so good, just like pumpkin pie filling! (I even used it to make pumpkin bread) Pumpkin is one of those things they say is unsafe to can though so I froze most of it. As far as the beginning canning equipment discussion, I started by just buying jars. I used a pie plate cooling rack (one of those small round ones)inside a regular stock pot to boil the jars. I used regular tongs to lift the jars out (tricky, but can carefully be done. The silicon coated ones work better). To this day, I still use a fork and quick fingers to get the warmed lids out of the water. And a funnel just makes filling jars easier and cleaner. Thank you for this 🙂 Fruit butters are likely my favorite of the fruit spreads out there, and I’m excited to experiment with additional layers of flavor in there. Are there any combinations of fruit and herb/other flavor you’d particularly recommend? I made an apricot butter seasoned with rosemary last year and I loved it. I’m thinking of doing an apricot/peach combo butter this year. I’m hoping the flavors will complement each other but I’m not sure. Any thoughts? Hey Marisa, you recently posted a link on FB to a blog that made strawberry lemongrass jam. I sent hubbie to find lemongrass at the local Asian market but he struck out (!!). Because I was ready to go I rummaged through my cupboard for something appropriate and found some lavander I’d dried last summer. Darn… no cheesecloth. Hey: a tea ball! In went the herbs, then into the cooking strawberry jam. I cooked the jam per the directions and pulled the tea ball after tasting the jam and determining that it was pleasantly floral without tasting like strawberry-lavander soap. Voila! Lavander-infused jam without bits of flowers and with a certain je ne sais quoi of the elusive and light floral background provided by the lavander. Lovely. Hi…I was introduced to your blog by a friend and have played a bit with the recipes. I made the slow cooker blueberry butter and LOVE the idea of canning from a slow cooker. I felt like my kitchen didn’t heat up as much and I could walk away without fear of burning. What else could you do in a slow cooker? Could you make a relish in the slow cooker? I assume you would have to bring it to a boil on the stove, but could you transfer it to a slow cooker for the thickening? What are your thoughts? What is the consistency of the blueberries in the slow cooker suppose to be by the end? I am new to canning! Sejal, the blueberry butter should resemble the juices from a blueberry pie. It does firm up as it cools so it shouldn’t be too, too thick when you’re taking it out of the slow cooker. I made Sand Plum Butter. It is great. Sadly not enough to stay around long. But two jars for me and my mother. Great spooned into some Greek Yogurt. Thanks for the idea. Oh MY! I must try this! I am now hunting for my old slow cooker. Not sure If I kept it or not because I received one of the new oval ones a few years back for Christmas. Any how, this has got my mind racing and I just can’t wait to try every fruit I can get my hands on. We’ve had such a weird spring/summer here in the Pacific NW that I think I can still get strawberries and blueberries. Hi Marisa. I love your site. I’m currently working on a batch of peach butter in my ancient crockpot. I have it on high, and it’s still not sputtering much. I’ve known it wasn’t very hot…it took me years to cook some lamb over Easter. How much total reduction do you look for when making (peach) butter? What seasoning do you put into sand plum butter, and how do you cook it in a slow cooker. Could you give me a recipe for making it? I realize this thread has been dead for some time, but I have a related question…I’ve made two fruit butters now in a crockpot which have come out delicious, but the consistency resembles more of a reduced (or very thick) applesauce rather than a buttery consistency. My butters still spread really well and taste like fruit butter, but why am I not getting the right consistency? I use a food mill. Do I need to use a smaller grate when I put it through the mill? Am I better off using a food processor or blender and just really getting after it to get it smoother before cooking it down? Could you please tell me how long to cook plumb in crock pot on low to make plumb butter. If I fill crock 3/4 full with plumbs, how much sugar should I add? When should I add spices, you mentioned that timing is important. Your blog is beautiful & inspiring! I’m loving your ‘Food in Jars’ book. Lynn, every slow cooker is different, so there’s no one size fits all timing for cooking down the plums. They are just done when they’re done. And as far as the sugar goes, start with about 1/2 a cup. Stir it in and taste. If you want it to be a little sweeter, add a little more. And always add the spices at the end of cooking, so that you mute their flavor with long cooking times. I am using a crockpot to make pumpkin butter and I peeled and cleaning in side the pumpkin and cut in chunks. Added 1 cup apple cider and sugar and spices and put it on low. I went to stir it after cooking 2 hours on low and the liquid turned slimmy. Did I do something wrong. Please help.thank you. I have no experience making pumpkin butter in a slow cooker, so I can’t help. So sorry. Another way to add flavor is flavored vinegar or balsamic vinegar. I made a cherry jam and added a tablespoon of almond creme balsamic and it was amazing! Had just a slight tart flavor from the vinegar. Today I’m doing blueberry butter with lavender vinegar. Can’t wait to try it! I have been making butters for several years now. I got really tired of the splattering so I started adding about 1/2-3/4 cup clear Gel (a thickening agent specifically for canning) along with the sugar and double my recipe. Of course, I don’t use the slow cooker. I do it all on the stove but it doesn’t take hours and hours, plus I don’t loose much of the original volume. My total cooking time is usually no more that an hour.